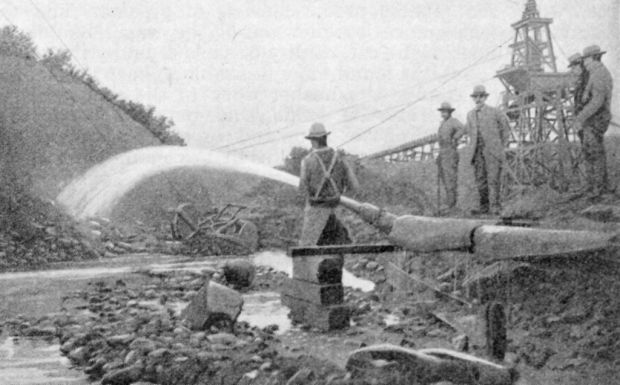 ﻿Giant nozzles were used at Greaterville, shooting high-pressure streams of water to remove overburden while washing gold-bearing gravel into sluices. Rockers were used to separate placer gold from sand and gravel at Greaterville. Forty-five miles southeast of Tucson on the east slope of the Santa Rita Mountains are the Greaterville gold placers, discovered by A. Smith in 1874. The deposit, at 5,280-feet elevation, became the most sought-after placer deposit — or accumulation of valuable minerals — in Southern Arizona over the next decade, with the average miner panning more than $10 worth of gold a day. The Greaterville Mining District was organized March 17, 1875. 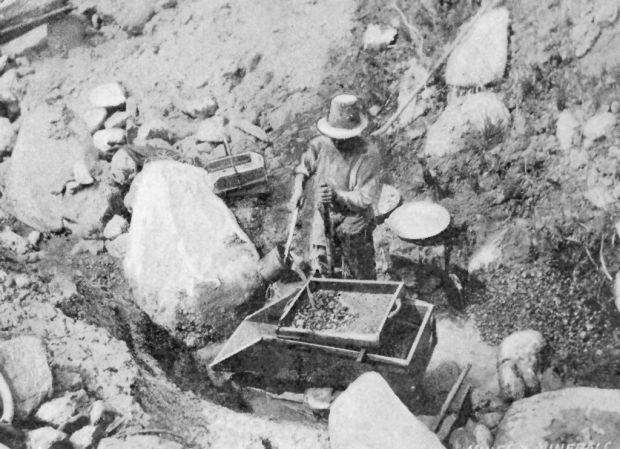 Several hundred miners were drawn to the area, finding gold nuggets valued at $1 to $50 apiece. A 37-ounce nugget was once reported to have been discovered. A group of stores, saloons and dancehalls were established to serve the needs of the mining community. In all, the Greaterville placers yielded $680,000 in gold, according to a 1929 report. Miners used rockers, sluices and long toms — shaped like long troughs — for separating the gold from the dirt. Burros transported water in Greaterville’s early mining history. Then, from 1886 to 1900, placer gold deposits in the camp became depleted, and sizable clay deposits and caliche proved a hindrance. Influenced by the success of hydraulic mining in the placer fields of California, in 1902 the Santa Rita Water and Mining Co. and a group of investors including millionaire George B. McAneny and mining engineer James B. Stetson revived placer mining in the district. However, the project would prove costly due to the high price of establishing a water system that would move massive deposits of gravel. The investors spent $175,000 to develop waterways from streams south of the Santa Rita Mountains to the gulches surrounding their company headquarters at Kentucky Camp. The water was used in placer mines around Greaterville, which encompassed several thousand acres. To transport the water over eight miles of ditches, 15- to 24-inch-diameter pipelines and tunnels were built. Water was acquired from impounding dams, which retained water, in the nearby canyons. Hydraulic work was done during the winter and early spring. Lack of adequate groundwater and reliance on streams that ran only during the rainy season, along with inadequate water-storage capacity during the dry months, led to Greaterville’s demise. In 1914, the Greaterville Dredge Gold Mining Co. bought 110 acres of property, intending to harvest water from local wells. The operation never got off the ground. By 1946, the post office closed, though a small Mexican community remained. Today, the ghost town of Greaterville is on private property and not open to visitors. Kentucky Camp saw its greatest years of operation between 1904 and 1906. But with the unexpected death in 1905 of partner James B. Stetson, who fell out of a window while staying at the Santa Rita Hotel in Tucson, the other partners ceased interest in the hydraulic venture the following year. After that, the buildings and land became a cattle ranch. The Coronado National Forest acquired the land by a land swap in 1989 with Anamax Mining Co.
Today, the ghost town of Kentucky Camp remains part of the national forest, which has stabilized four of the five original buildings, including an office, several cabins and an assay building. While Greaterville isn’t accessible, Kentucky Camp is open to visitors, who can even stay overnight in a restored three-room cabin. Reservations are available through the Forest Service. Sources: “Arizona Gold Placers,” University of Arizona Bulletin No. 118 (M.A. Allen, 1922); “Kentucky Camp: Big Dreams, Small Prospects” from Archaeology in Tucson newsletter (Mary Farrell, 1993); “Contributions to Economic Geology,” Dept. of the Interior, U.S. Geological Survey (C.W. Hayes and Waldemar Lindgren, 1909); U.S.G.S. Research on Mineral Resources-1994 Part B-Guidebook for Field Trips, U.S. Geological Survey Circular 1103-B “Historic Mining Camps of Southeastern Arizona: A Road Log With Geologic and Historic Highlights,” by Brenda B. Houser, Mary M. Farrell, Eric R. Force, James A. Briscoe, Leslie J. Cox and John Wiens; “Principal Gold-Producing Districts of the United States,” U.S. Dept. of the Interior (A.H. Koschmann and M.H. Bergendahl, 1968).